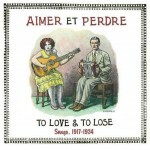 Released appropriately and sarcastically enough on Valentine’s Day, this new set of 78s is summed up aptly by Robert Crumb, who always loved this sort of stuff and who furnished a drawing of Joe and Cleoma Falcon, singers of “Aimer Et Perdre (To Love And To Lose)” itself. 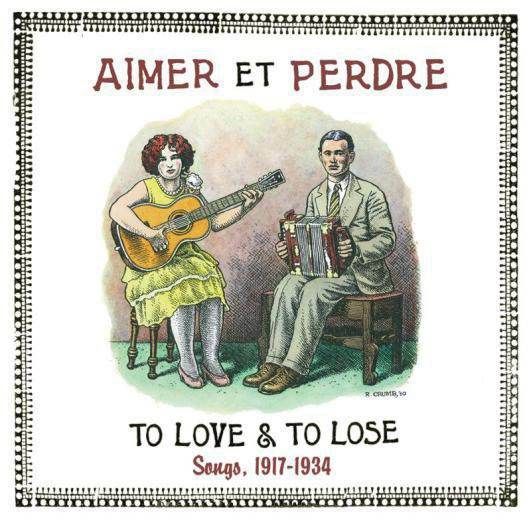 Crumb takes an old portrait of the married couple for inspiration, but doesn’t describe them as a couple (and those voluminous liner notes don’t either). Cleoma, with her guitar, looks ready to take on the world. Joe, with his accordion, looks ill at ease, remembering, or trying not to remember, something he wouldn’t dare tell Cleoma. Back and forth flit these mini-sagas of love and loss between our plug-points of jubilation and devastation and quite often some arc between. “I Never Will Marry” from the Carter Family seems like an easy one—narrator finds lamenting woman, lamenting woman laments, lamenting woman takes her own life—except, at the end, does the narrator merge with the lamenting woman? “I expect to live single / All the days of my life”—what can that mean, when life is measured in seconds? And for a self-sacrifice to romantic love, she’s awfully canny about getting chummy with the fish, stops just short of saying they’ll nibble her into facelessness. 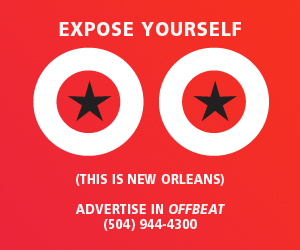 You need the notes because most of the songs aren’t in English, and many practices embodied in the tunes aren’t familiar to WASPs, or, for that matter, to latter-day Polish-Americans, Ukranian-Americans, Cajuns, etc. Some singers stand out through the language barrier: I’m thinking of Dennis McGee crying through his throat and his fiddle all the way through “Madame Young, Donnez-Moi Votre Plus Jolie Blond.” Richard “Rabbit” Brown, from New Orleans, possibly surfacing from a netherworld, sings “Never Let the Same Bee Sting You Twice” but his constipated, darkly dutiful delivery kills any sensibility in the lesson, any possibility of learning. “Life to me is a big mistake” or just possibly “a bad mistake.” Either way, game over before it started.